Coyoty makes waffled pumpernickle grilled cheese. 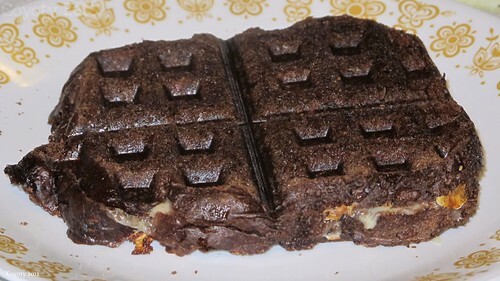 Waffled pumpernickle grilled cheese, a photo by Coyoty on Flickr. Home-baked King Arther pumpernickle bread with American and parmesan cheeses. I also found out that J.C. Penney's Cooks waffle maker has a handle that breaks off easily. Coyoty eats Japanese Doritos: Steak Krazy Mixed-Up Salt flavor and Salami flavor. 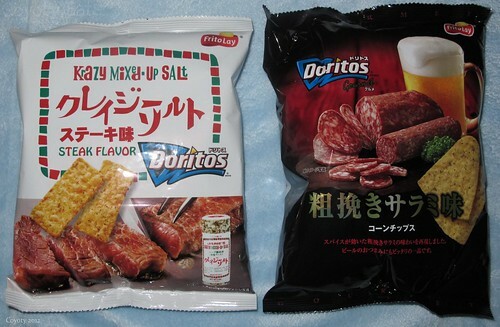 Japanese Doritos: Steak Krazy Mixed-Up Salt flavor and Salami flavor, a photo by Coyoty on Flickr. Purchased from Jappy11 on eBay. Tonight's theme is flavors that do not taste like they're supposed to. The steak Doritos don't taste anything like steak. They taste like Krazy Mixed-Up Salt seasoning for steak, which I like a lot. I'm assuming there's a translation problem. The salami Doritos taste more like Portuguese smoked chorizo, which I also like a lot. I may be lucky to get flavors that taste better than what I was expecting. Coyoty eats Japanese Sausage and Bacon Pringles. 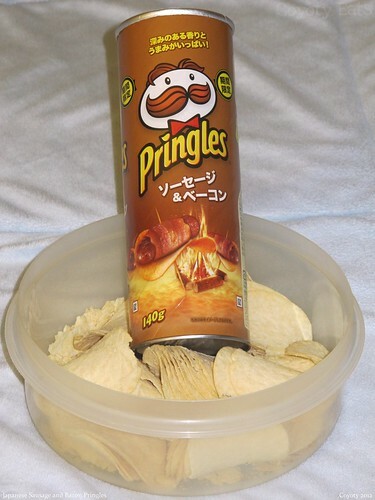 Japanese Sausage and Bacon Pringles, a photo by Coyoty on Flickr. These are very good, though they do taste a little like salt and vinegar as well. They smell like salt and vinegar when the can is opened. Unfortunately, the trip from Japan leaves a lot of them broken up, so imported Pringles aren't very good for dipping. You'll need a Lipitor prescription to watch this. P.S. Remember, this is a family restaurant with children present. Please be considerate and keep the noise and language civil.